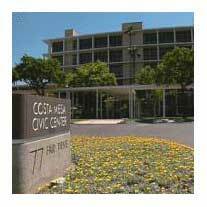 The City of Costa Mesa is actively recruiting for volunteers for several city committees. Here is the text from the most recent press release on this issue. Cultural Arts Committee: This committee works to promote the City slogan: “City of the Arts.” The Cultural Arts Committee has started a Youth Gallery in City Hall and maintains a directory of local artists. The Council will appoint four regular members and two alternate members. For further information, please contact Lisa McPherson at (714)754-5322. Historical Preservation Committee: The Historical Preservation Committee serves to maintain, preserve, educate and promote the City’s historical resources, and advises the City Council on such matters. The Council will appoint one regular member and one alternate member. For further information, please contact Lisa McPherson at (714)754-5322. Redevelopment and Residential Rehabilitation (3R) Committee: This committee promotes understanding of, and involvement in, the redevelopment of housing throughout the City and commercial properties within the redevelopment area. The committee serves as an advisory board to both the Redevelopment Agency and the City Council on housing-related and neighborhood issues. Committee members provide input on the eligible uses of Community Development Block Grant, HOME, and Redevelopment Agency funds. The Council will appoint five regular members and two alternate members. For further information, please contact Alma Penalosa at (714) 754-5692. Investment Oversight Committee: The purpose of the Committee is to review the City and Redevelopment Agency’s portfolio and investment strategies for compliance with the City and Agency’s adopted investment policies. The role of the committee shall be advisory to the City Treasurer. The Council will appoint one committee member and one alternate member. Candidates may either reside or conduct business within the City and should have a background that includes experience in securities trading, financial planning or banking. For further information, please contact Colleen O’Donoghue, assistant finance director, at (714) 754-5243. Costa Mesa Senior Center Board of Directors: The Costa Mesa City Council is recruiting individuals interested in serving on the Costa Mesa Senior Center Board of Directors. The Council will appoint one director to fill a vacancy and to serve on the board to represent the City for the remainder of a two-year term (to be extended to October 2012). For more information, please contact Donna Theriault, recreation management analyst, at (714) 754-5636 or email dtheriault@ci.costa-mesa.ca.us. Application Process: Individuals interested in serving on any of the above committees should complete a “Committee Interest Form” available in the City Clerk’s Office or on the City’s website at http://www.costamesaca.gov/docs/commform.pdf. The completed form may be mailed to: Costa Mesa City Clerk, Post Office Box 1200, Costa Mesa, California, 92628-1200; faxed to (714) 754-4942; or hand-delivered to the City Clerk’s Office at City Hall, 77 Fair Drive, Costa Mesa. The deadline for submission is 5 p.m., Monday, Oct. 3, 2011. The City Council will make selections from applications filed in a timely manner. For further information, please contact City Clerk Julie Folcik at (714) 754-5225 or julie.folcik@costamesaca.gov. Why in the world would anyone volunteer to do anything for this morally and ethically bankrupt city? The scumbag councilmen don't even listen to their Paid consultants! These guys keep pushing for the illegal outsourcing scam to get ahead in politics and have no intention of listening to what residents have to say about anything that won't help them personally. Furthermore, the will interrupt and try to silence whoever tries to speak against them or speaks the truth about their illegal outsourcing scam. Don't believe me? Watch the last council meeting where Pigheimer tries to shut Leece up. I would love to volunteer. However, I've seen how badly the councilmen treat their own fellow councilmember and also residents who get up and speak at council meetings. I will definitely be interested when the councilmen are off the council next year. perhaps some of the usual speakers at council meetings who seem to understand our city's finances better than the experts can apply for the investment oversight committee. or better yet, just attend them and criticize the appointed members. The problem for the scumbag morally bankrupt council is that they can't just appoint their out of town buddies onto the committees. The only CM resident piggy knows has already been appointed to the city council. The City has never heard from n expert in anything besides the real PERS rep. The other old guy who needed to catch a plane was a paid YesMan. The rest are scumbag morally bankrupt YesManPiggy wanna be's and slimeball attorneys. Oh wait, do lawyers come in any other fashion? How about a Brown Act committee! The history committee should be renamed the decimation committee because that is the only history this city has left. "what's in a name" says we should have a decimation committee. Perhaps. If so, exhibit number one is police and fire pensions and retirement ages. It has not been reported here but right next door in Santa Ana, the union managed to decimate the city. It wasn't the bad ol OCGOP folks running the show there either. The libs run the city, spent the hidden "pots of gold" and now everything is going downhill. Wake up you haters, the math is plain to see. Quit calling names for once and do some cypherin. Then go thank Piggy, messy, the beav, and our pint sized mayor for their vision and ask Leece why she is a union shill, willing to harm this city for a little applause from the greedy. That is funny to think that the Haters here would even think about volunteering. It is one thing to talk about bull fighting. It is another to step in the ring. A big chunk go away as they do not live here. Another chunk because they work here. That leaves Greg Ridge. And no one would appoint him. Geoff West would never apply. He'd rather sit in the back of a Council meeting and throw shots at those who are changing our city. He knows he'd never get appointed. Who's left. Tom Eagan? Appears his health would not allow it. And would receive at least 4 heck no votes. Sandy Genis could not get enough votes in here own neighborhood for a special district election. Captain caveman McEvoy has gone underground. I think many here are angry because they are no longer relevant. “May I stress the need for courageous, intelligent, and dedicated leadership… Leaders of sound integrity. Leaders not in love with publicity, but in love with justice. Leaders not in love with money, but in love with humanity. Leaders who can subject their particular egos to the greatness of the cause.” - Dr. Martin Luther King, Jr. I think I will apply for a committee. ....And, not to forget that I too will soon get a City Council appoinment. Can't say what yet, but you will know when you see it. I AM an expert and I will show all of you what should be done. Righeimer should be President and Mensinger Vice President. Secretar of Stae would be Martin Mallard. In Costa Mesa, Piggy is trying to blame the municipal employees for bankrupting the city. Yeah ok. Believe that and I got a few bridges to sell you. Yeah, the municipal employees are retiring at 3@50. mmm hmm sure. In Costa Mesa, as well as surrounding cities and counties, it's the POLICE & FIRE that are bankrupting "the system". NOT the municipal employees. Get it straight people, what's going on in costa Mesa is just a stunt. Even if they're successful in their outsourcing scam, the POLICE & FIRE will still be there to bankrupt the system! So why don't they fight POLICE & FIRE? Because their union is strong. If I were employed by the City, I'd go Teamster on them. Costa Mesa is lucky their employees are just a bunch of cry babies. unanimous oh my god you solved the problem!!!! Let's just have 60 year old cops running around on our streets because I am sure that won't lead to injuries and even more expensive medical retirements. Unanimous, tell me, is it rough going through life with a simpleton brain and logic? It is disappointing that none of the Council critics apply for these positions. All I see here are excuses. Do the Haters really think they bring about change at a podium or on a blog? Younger residents with families don't have the time for committees. If they are committed to their families, they are busy working, coaching sports and being scout leaders etc. Frankly it generally is the retired folks or those without children who have the time to commit to such endeavors. Even a true businessman wouldn't have time to be a councilman. if he is committed to his business his time would be spent running a business and spending family time. That is of course unless their priorities are misguided. Greg Ridge is BOYCOTTING this current administration at city hall. Be grateful I don't have more time on my hands.....G.
I think what will turn most away from even applying for a committee position is stated right there in the application procedure...."The City Council will make selections from applications, blah blah blah" Oh yeah, I'm sure they will select from a diverse group and base their selections on whomever is most qualified. The corruption continues. "And, not to forget that I too will soon get a City Council appointment. Can't say what yet, but you will know when you see it. I AM an expert and I will show all of you what should be done." I'm a sell-out and a shill just like Monahan and Bever and things were promised to me too. Beaver was a ling haired dumbass who got placed on council to simply shut up and do what he was told. He is as useless as the weekly lies published by the city. The corruption certainly will continue and our hard earned money we pay in taxes keep getting flushed down the toilet. $1,000 an hour in unnecessary legal fees, $3,000 a week PR guy, 2 new positions at $184,000 a pop and $684,000 in unnecessary staff to hide their corruption and defend their illegal outsourcing scheme. All this government waste as my neighbors in Costa Mesa are unemployed and losing their homes. Can't until next November when all the morally bankrupt councilmen are off council. Planning commissioners need not run. We're all onto you McCarthy, Fitzpatrick and other scum! This blog has gone from something of interest to something more like the Jerry Springer show. Lots of emotion. And emotion on top of emotion. The major difference is that Jerry Springer held his ratings. Geoff West is losing quality comments, viewers and supporters almost as fast as other local cities are following the actions of Coats Mesa. Costa Mesa will be recognized as the so cal leader that it is. Why all the hate.....Thanks for the laugh, that post was the funniest bit of comedy I've read in a long time. PD chief working magic, quality new hires....that is good comedy.